When you saw “Vulture” in the title, what came to mind? Did you think of the Marvel® comic book character? Of big, red-headed black birds pecking around fresh road kill? Important members of almost every continent’s cleaning crew? A featured friend of raptor fans at the zoo? How about “all of the above”? Vulture in flight. Photo: Dennis Dow/Woodland Park Zoo. 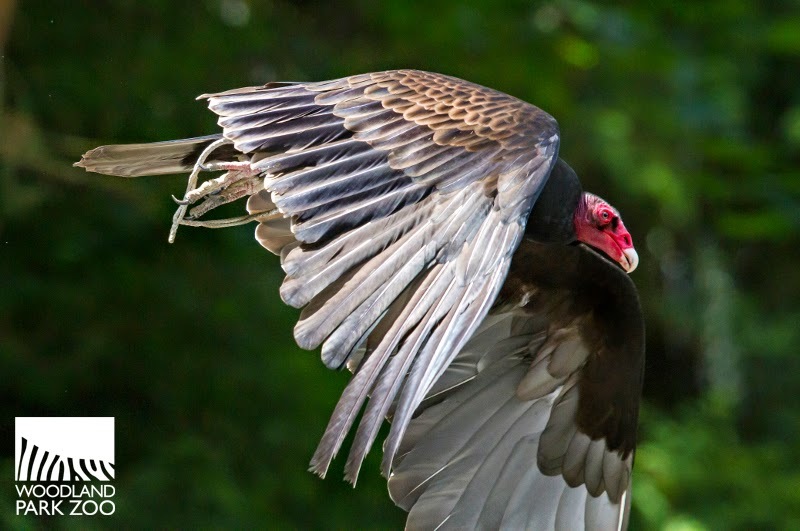 The cartoon version is property of Marvel comics and we’ll let Marvel speak for him, but living, breathing, feathered vultures are represented at Woodland Park Zoo by Modoc, the zoo’s turkey vulture (Cathartes aura). Mo is a member of the Raptor Center’s educational team. He is the zoo’s ambassador for all vultures around the Old World (Europe, Asia and Africa) and the New World (the Americas). Susan Burchardt, one of the zoo’s raptor keepers says, “Vultures are easy to ignore or vilify, but they are a cornerstone in so many ecosystems.” They’re often misunderstood. On September 6, International Vulture Awareness Day, the zoo’s raptor keepers will help “grow the love.” We think vultures are marvelous! Modoc the vulture. Photo: Mat Hayward/Woodland Park Zoo. In the wild, vultures live in large groups sometimes called wakes or committees. They are scavengers—they eat only fresh kills (once a carcass begins to smell, the vultures lose their appetites for it) and they have tough guts: anthrax, hog cholera, and botulism are no match for vultures’ stomach acids. Besides cleaning carcasses, vultures help keep these lethal bacteria out of our ecosystems. Imagine the mess if we didn’t have vultures’ help: rotting carcasses, germs and disease spreading, flies everywhere, and the smell! 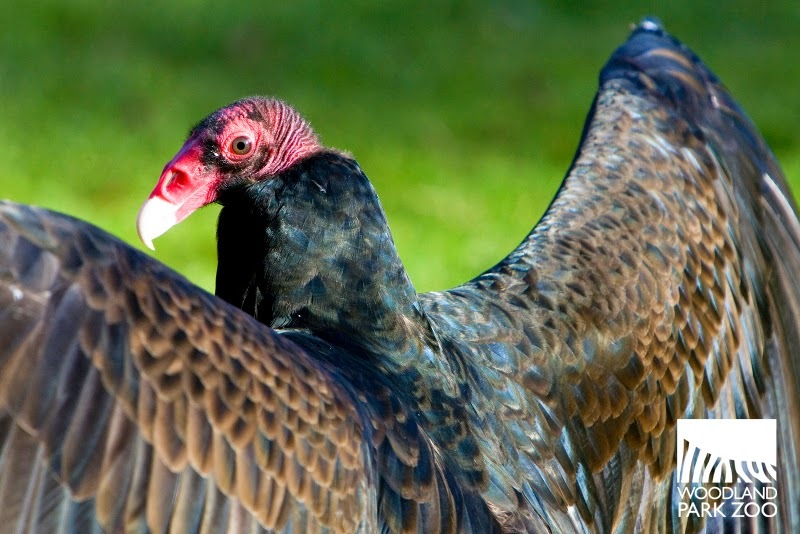 Vultures are an example of divergent evolution. Old World species look similar to New World vultures, but the Old World species evolved to find food visually—they keep an eye on snow leopards in the Himalayas and move in to eat what the snow leopards leave behind. 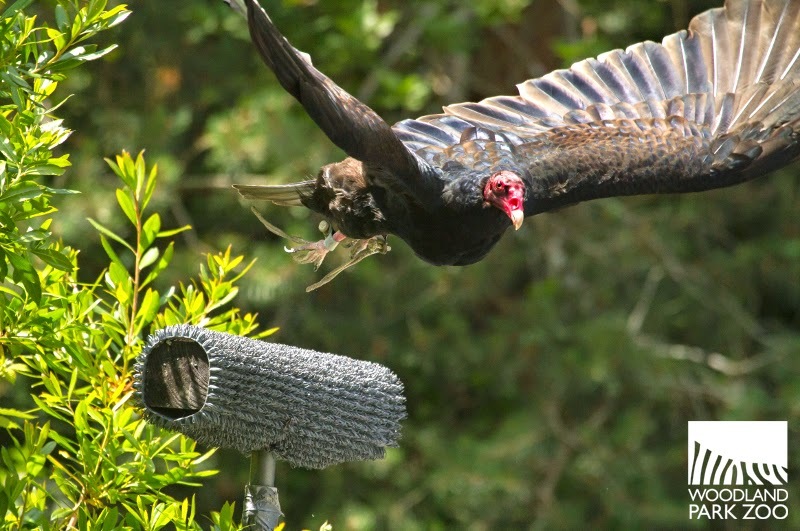 Some New World species, including California condors and turkey vultures, are able to smell a fresh kill up to a mile way and swoop down to begin cleaning the carcass right away. They sometimes fly high overhead, circling, waiting for an animal to die. Vultures are known to circle overhead. Photo: Dennis Dow/Woodland Park Zoo. Circling is a useful but unfortunate behavior. In Africa, Old World vultures circling over poached elephants guide game wardens to poachers—and in a grim turn, poachers have started poisoning the elephant carcasses, killing hundreds of vultures while the poachers escape with the elephants’ tusks. Poachers’ poisons aren’t the only threat. Cattlemen in India and Africa accidentally poison them too. You see, vultures aren’t picky about the meat they eat, so they sometimes eat cattle carcasses. Diclofenac is a common veterinary drug once given to cattle in India and Africa (and still administered in some European countries). The drug, as used by humans, is perfectly safe, but though vultures can easily stomach anthrax, diclofenac is poison to them. Hundreds of thousands of vultures have died in India and Africa after eating the meat of inoculated cattle. What a beauty! Photo: Dennis Dow/Woodland Park Zoo. The Migratory Bird Treaty Act of 1918 protects vultures in the U.S., but as you can see, the same is not true for other vultures in other places. The zoo is one of hundreds of organizations helping raise awareness of vultures through International Vulture Awareness Day. The zoo’s celebration will focus on vultures’ habits, diets, and threats; and ongoing research, including banding, tracking, and analyzing pellets. (Don’t know what a vulture pellet is? Come by! They’re fascinating, we promise.) Mark your calendars, join the fun! Vulture Pellet Guess: participants will guess the number of vulture pellets in a jar. Prizes will be awarded at 2:30 p.m. I did not know there was such a thing as International Vulture Awareness Day. This is a great post and a good read, thank you.